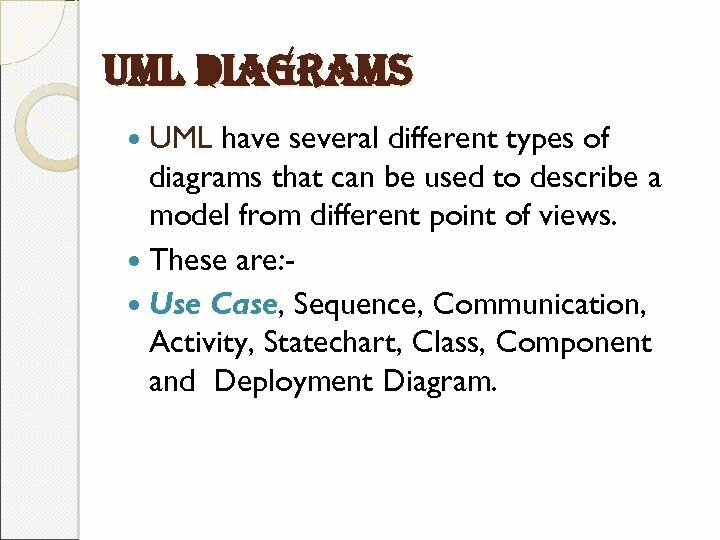 uml diagrams UML have several different types of diagrams that can be used to describe a model from different point of views. 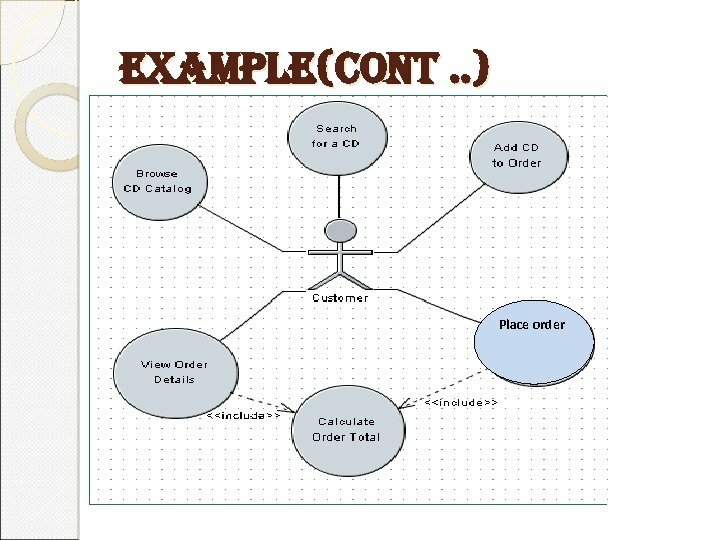 These are: Use Case, Sequence, Communication, Activity, Statechart, Class, Component and Deployment Diagram. 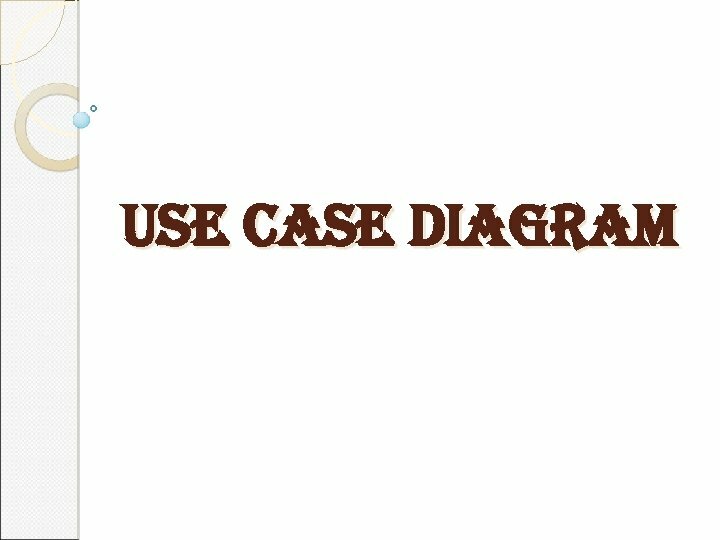 use case diagram: A use case diagram is “a diagram that shows the relationships among actors and use cases within a system. 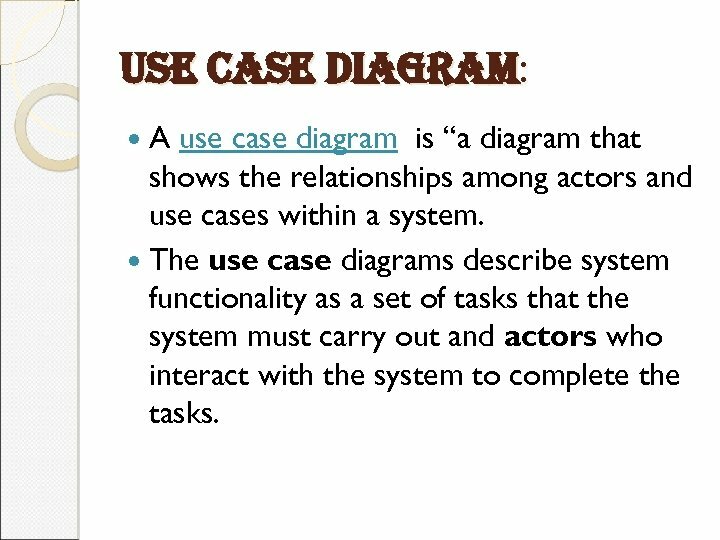 The use case diagrams describe system functionality as a set of tasks that the system must carry out and actors who interact with the system to complete the tasks. 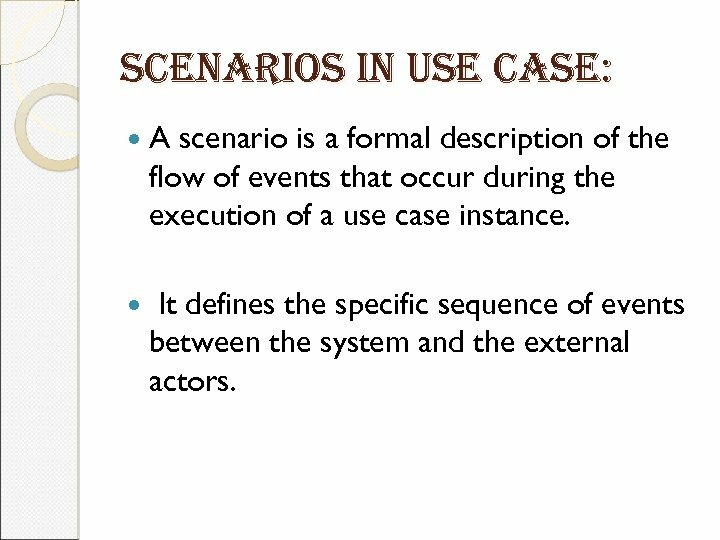 scenarios in use case: A scenario is a formal description of the flow of events that occur during the execution of a use case instance. 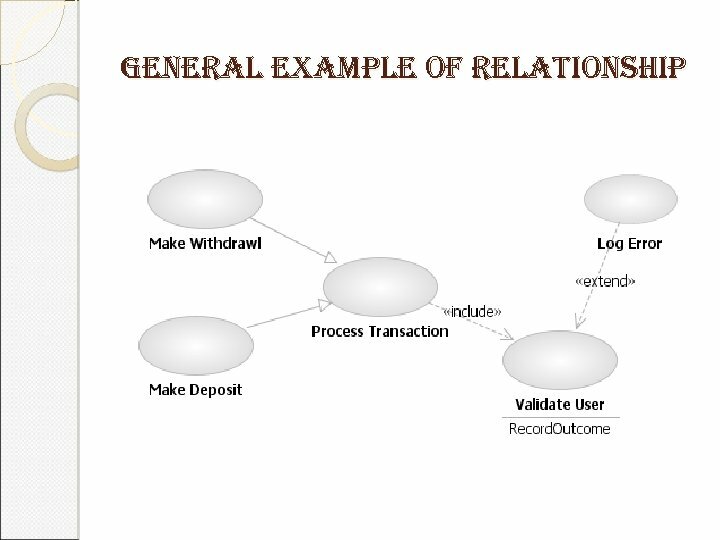 It defines the specific sequence of events between the system and the external actors. 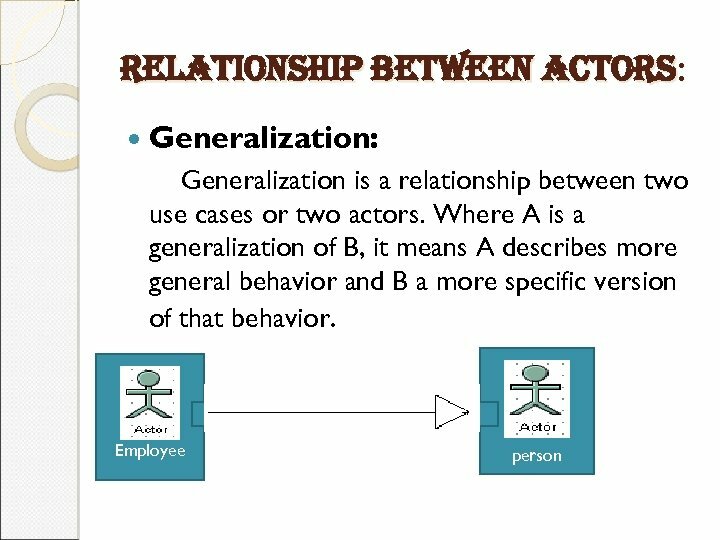 actor : An actor is anything outside the system that interacts with the system to complete a task. It could be a user or another system. 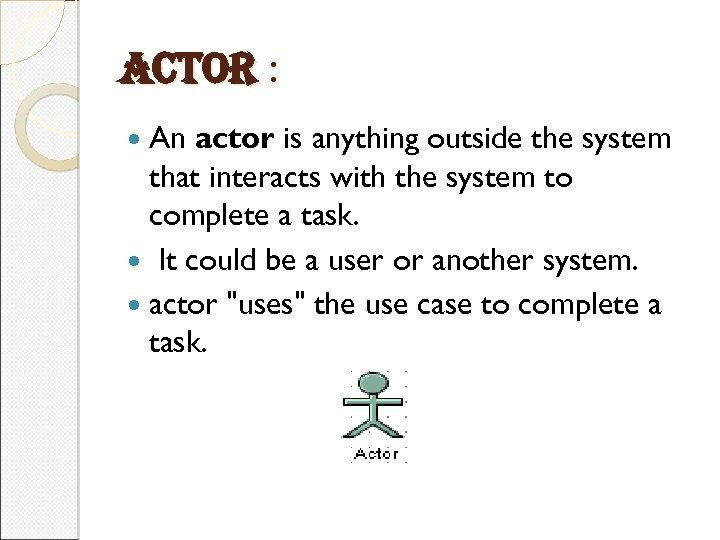 actor "uses" the use case to complete a task. 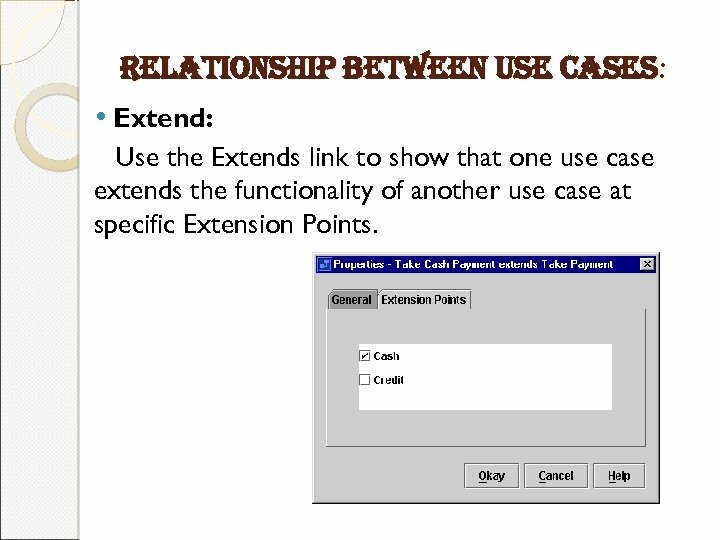 relationship between use cases: • Extend: Use the Extends link to show that one use case extends the functionality of another use case at specific Extension Points. 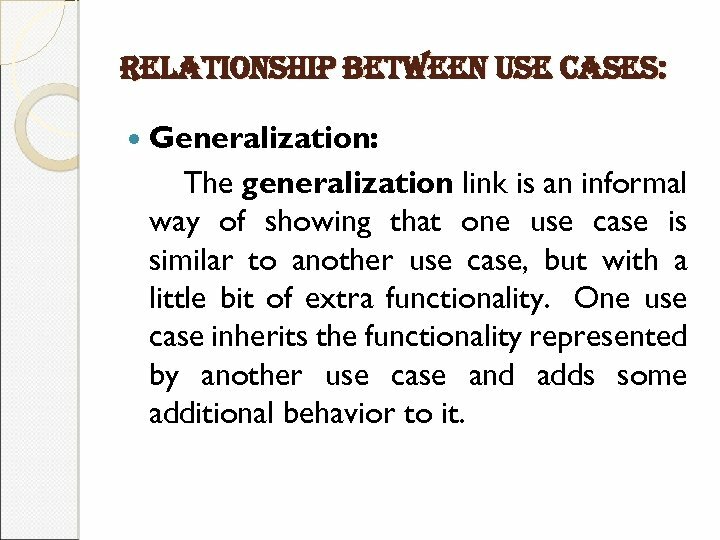 relationship between use cases: Generalization: The generalization link is an informal way of showing that one use case is similar to another use case, but with a little bit of extra functionality. 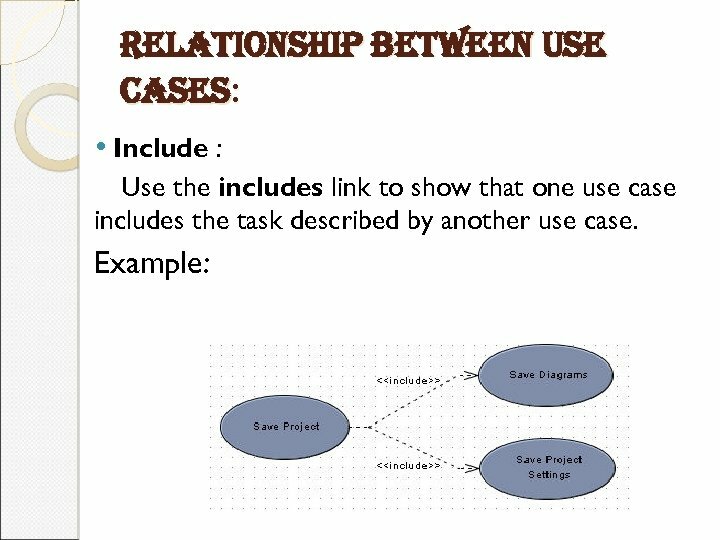 One use case inherits the functionality represented by another use case and adds some additional behavior to it. 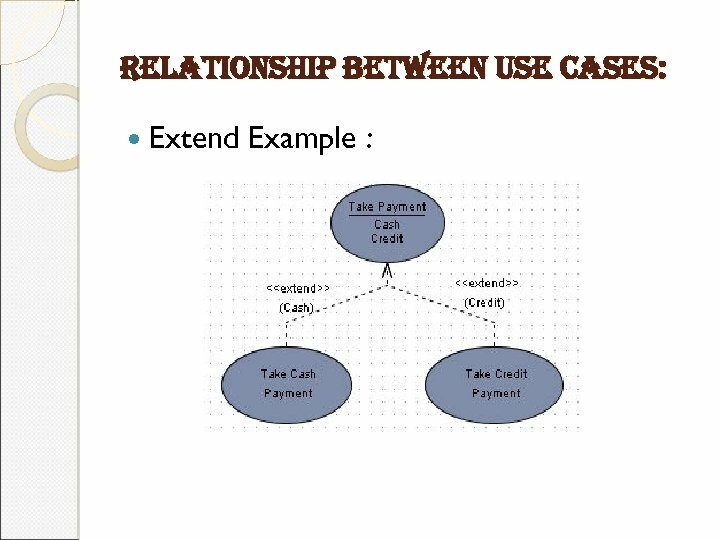 relationship between actor and use case: • Association: The association is the link that is drawn between and actor and a use case. 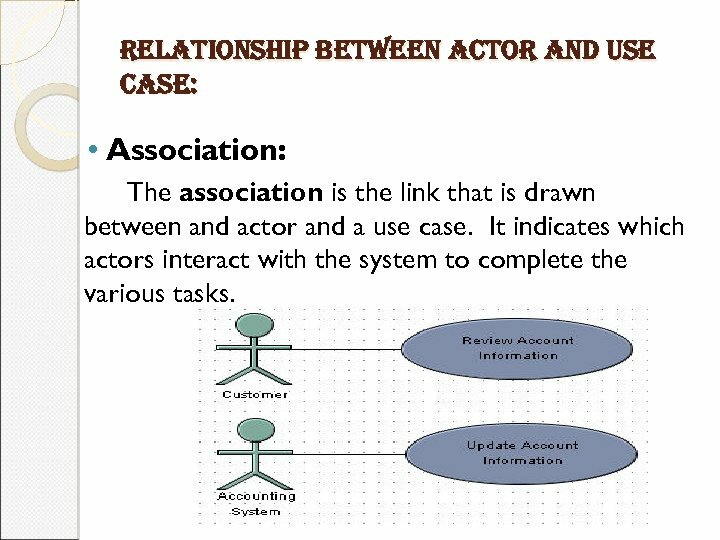 It indicates which actors interact with the system to complete the various tasks. 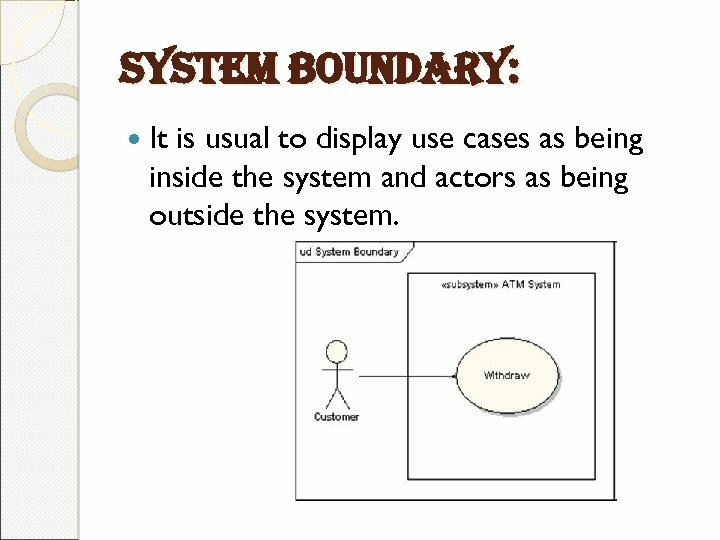 system boundary: It is usual to display use cases as being inside the system and actors as being outside the system. 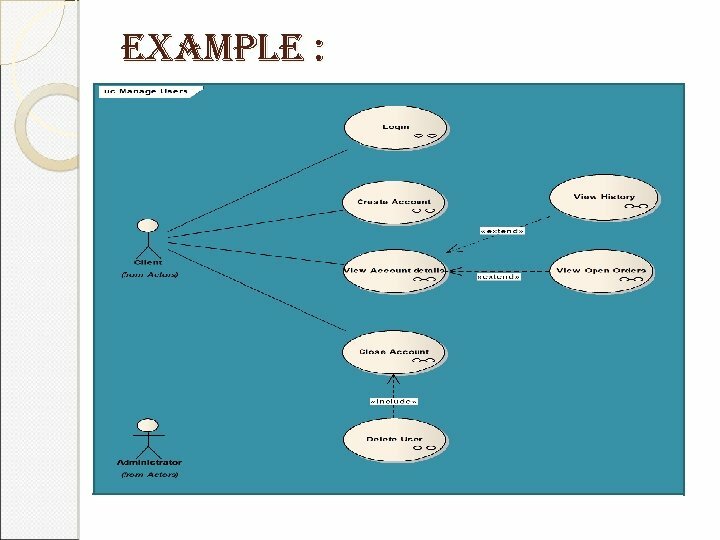 example: The following sample shows a Use Case Diagram for an on-line CD catalog. 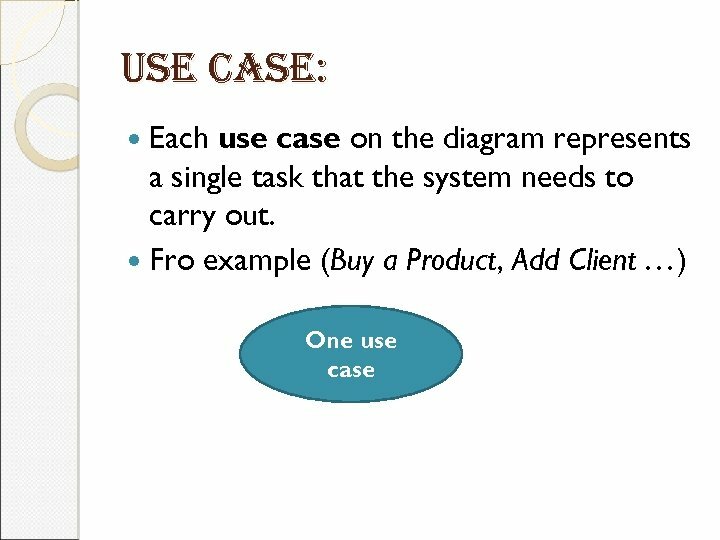 The system has a single actor: the on-line customer. 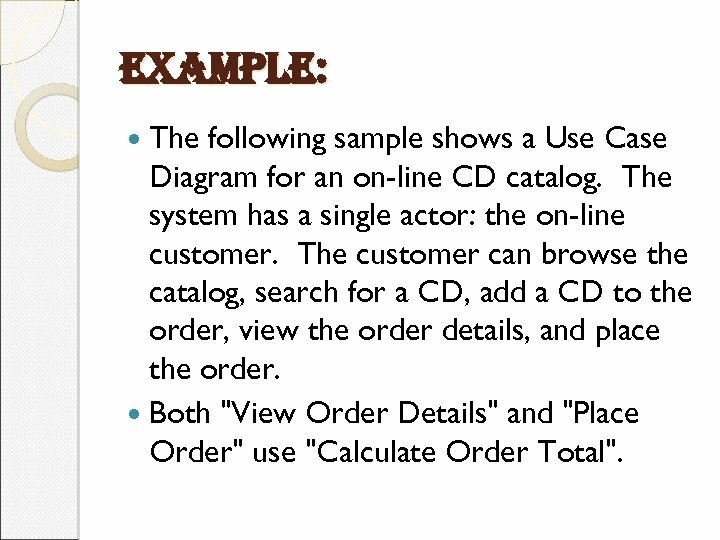 The customer can browse the catalog, search for a CD, add a CD to the order, view the order details, and place the order. Both "View Order Details" and "Place Order" use "Calculate Order Total". 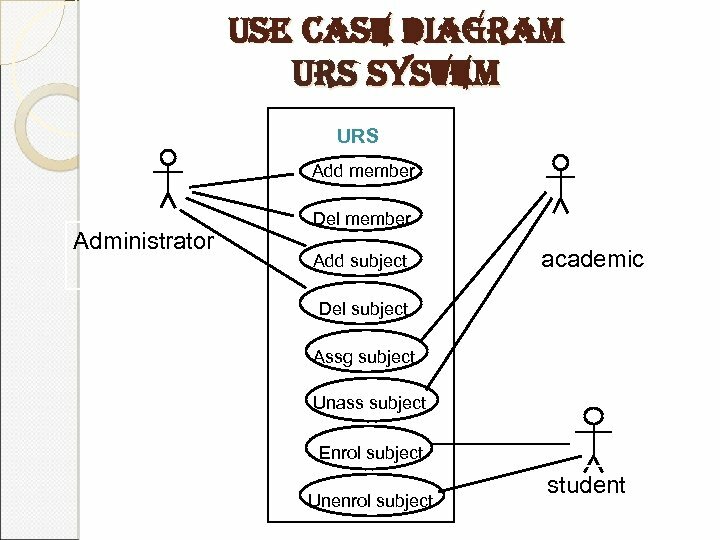 university record system (urs) A University record system should keep information about its students and academic staff. 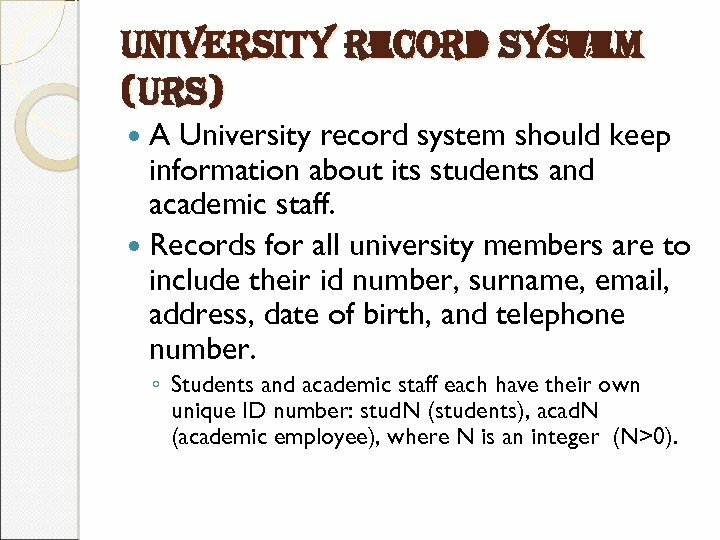 Records for all university members are to include their id number, surname, email, address, date of birth, and telephone number. ◦ Students and academic staff each have their own unique ID number: stud. N (students), acad. N (academic employee), where N is an integer (N>0). 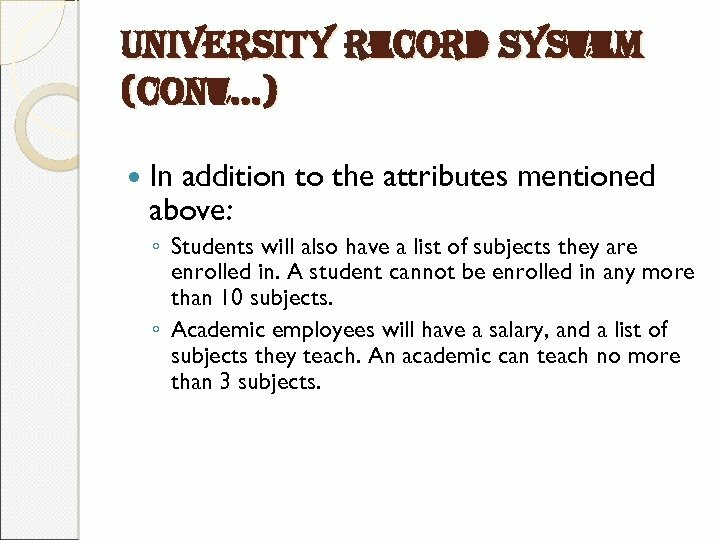 university record system (cont…) In addition to the attributes mentioned above: ◦ Students will also have a list of subjects they are enrolled in. A student cannot be enrolled in any more than 10 subjects. ◦ Academic employees will have a salary, and a list of subjects they teach. An academic can teach no more than 3 subjects. 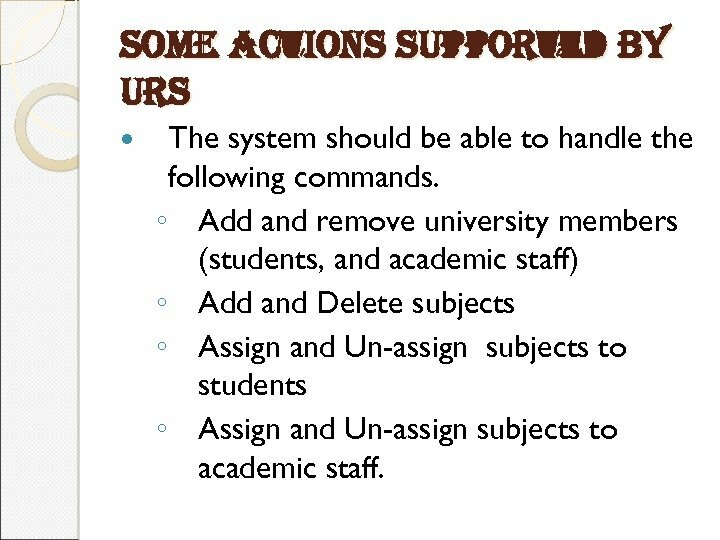 some actions supported by urs The system should be able to handle the following commands. ◦ Add and remove university members (students, and academic staff) ◦ Add and Delete subjects ◦ Assign and Un-assign subjects to students ◦ Assign and Un-assign subjects to academic staff.